Wow, I could have had a Vigna Traverso! Seriously, this wine was like drinking your vegetables, which I love very much. This is the 2005 Vigna Traverso Refosco from the Colli Orientali del Friuli appellation of Italy. This DOC is in the province of Udine in the north east corner of Italy. Basically on the back of the boot rim. Red wines only account for about 35% of the wine production in this DOC and the main grape is typically merlot. But this one, obviously, is produced from the refosco grape. This is a deep violet colored grape with slight bitterness and powerful tannins. It is also know as the terlan or terlano grape and eastern France it goes by the name mondeuse. I just fell in love with this wine. It was the first time I’ve had this grape or any wine from this region, for that matter. It has the characteristic deep purple color. 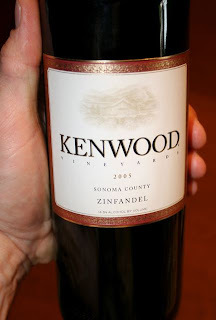 The nose was earthy and bright with hints of red cherries, twizzlers and a bit of forest floor. It really pleased me on the palate. Talk about old world! It was nicely balanced with fruit and vegetables. Think hints of raw green peppers blended with a can of V8 and some red cherry juice shaken on top. Very intriguing and delicious. It certainly had solid tannins but they weren’t overpowering in any way. It was really well balanced. I would say it will last at least another 6-8 years. What goes better with pizza than a nice chianti classico? 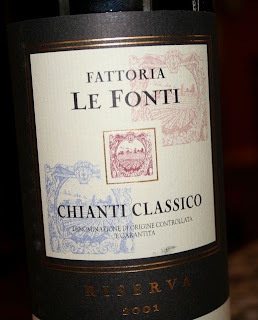 Friday night was pizza night at our house and I opened up a 2001 Fattoria Le Fonti chianti classico. If you don’t know about chiantia, it is the largest region in Tuscany. This is made largely from the sangiovese grape. This bottle was pretty darn good. It had a nice color just edging on brick red. On the nose were aromas of berries and red fruits. Interestingly there was a subtle hint of furniture polish, kind of like lemon pledge. Strange, I know, but it wasn’t a bad thing. The palate was very interesting. It was earthy with a medium body. 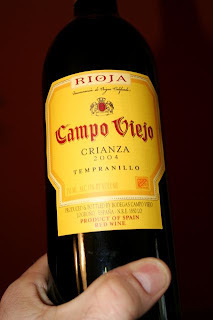 There was a pronounced acidity that cut through the red fruits and I liked that very much. It had a solid tannin structure but they were nice and soft. There were nice hints of mocha and rusty nails dancing around my mouth. This was definitely a classic chianti classico in all respects.